I recently came across the following ballad/verse in Sabine Baring Gould’s ‘Book of the West’ which was first published in 1899. 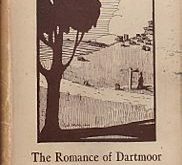 It retells the famous Dartmoor legend of the Blackingstone Ravens which is all about a mother leaving her baby ‘home alone’ whilst she went to Moretonhampstead Fair (nothing changes except they go to Spain now). When she returned she found a bloody heap of tiny bones and three well fed ravens. Incidentally, today the Ordnance Survey mark the isolated habitation as Brinning (OS Grid Reference SX 75255 85038) but locally it was always known as Brennan. Down-a-down, hey and hey ! Saying, Where and O where shall we dine today ? On the moor, for sure, where runneth no way. For Babie and me to buy trinkets rare. Away to Brennan, black brothers, with me. There is plenty for all of us, brothers three. Save a little white huddle of well-picked bone.